Amazon is such a peculiar behemoth, straddling retail, tech, grocery, and more (aeronautics, perhaps? ), that there are a myriad of ways to analyze it. However, I’m going to stick to the fundamentals, and in particular I’ll take a close look at one area in particular: cash flow. CFO Thomas Szkutak himself said that Amazon’s main financial goal is “maximize free cash flow over the long term”—he’s stepping down, by the way. But, I believe it’s the most important, particularly in the (allegedly) cash-rich position from which Amazon operates. Like many investors, I believe that cash is the best barometer of health, and partially because it’s harder to fudge the numbers than it is with earnings (though there’s still room for creativity, as we’ll see later). 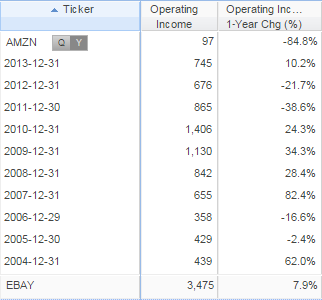 In this article, I’ll go over some troubling trends I see when I look at Amazon’s financials, including sales and margins, operating income, share dilution, and reduced liquidity. In 2009 it issued $341 million in stock-based compensation and in the last 12 months that was up to $1.1 billion—that’s an increase of 236%. To counteract dilution, the earnings reports show that the treasury stock has gone from 600 million shares to 1.8 billion shares—an increase of 206%. To me this looks like a company transferring wealth from shareholders to management and employees. This past quarter Amazon’s revenue was $20.58 billion, increasing 20.4% since the previous year’s third quarter, which is a strong growth rate, to be sure. Additionally, even with TTM sales at $85 billion, it still should have plenty of room to grow. Wal-Mart is still over 5 times larger with TTM sales of $480 billion. However, its growth rate has been slightly slowing, as you can see below with 10-year historical data. What’s more, Amazon has indicated that they don’t think it will get much better, as their “Financial Guidance” section of their most recent Quarterly Results details an expected growth rate between 7% and 18% for Q4 (over Q4 2013), which, even at the upper estimate, would be a further deceleration in growth. 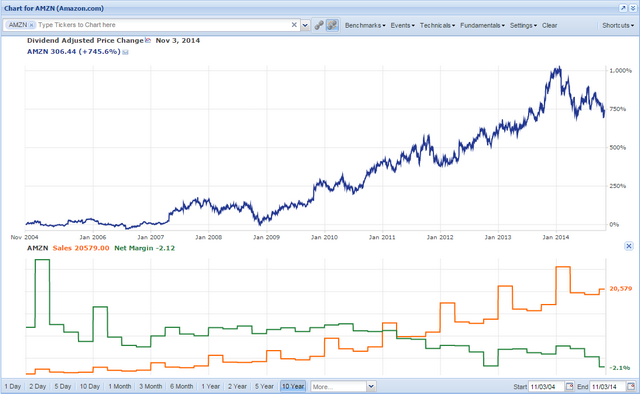 So the prognosis for sales doesn’t look good, and, as it turns out, neither do its margins (see the sneak peak above). 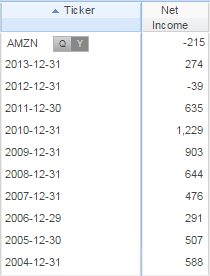 Below I’ve charted Amazon’s price, along with its Sales and Net Margin over the last ten years. That pattern in the secondary chart is ominous: it’s showing that as sales (orange) increase, net margins (green) are decreasing, meaning that the company is getting less efficient as time goes on. Ideally, we’d like to see both of these lines headed upwards, which would mean that not only are sales going up, but Amazon is getting better at turning those sales into profits. If we look at just the Net Margin with the Gross Margin (below), we can see that actually, the Gross Margin is going up, meaning that Amazon is getting more efficient in the production process. But, the Net Margin is going down, so it’s not translating that efficiency to the bottom line of the business. What’s more, Amazon is pursuing even more endeavors with thin margins, such as AmazonFresh, its new grocery delivery service, as well as expanding Amazon Prime. However, those two aren’t its only ventures—in fact, the Services segment of sales has higher margins than the Product segment, and it’s growing faster too—up 38% from Q3 2013, whereas product sales were up 16% in the same time period. If those sorts of growth rates continue, it is possible that Amazon can begin to turn around its margins—but the current trajectory doesn’t look promising. Looking at the operating income will help us gauge how much Amazon could potentially make in profits. As a general rule, shareholders like to see this number going up over time. Here it is, along with the percentage change year over year for the last ten years. For a while the operating income was increasing, but it took a sharp turn downwards in 2011, and experienced another drastic decrease in the last twelve months. Of course, Amazon has been investing in their business (that kind of seems to be its thing), such as cloud services and warehouses, which it says it will pay off in the future. So, what has it been spending that money on? According to Morningstar (below), total yearly Operating Expenses have increased 451% since 2009, now at $24,262 million. While Sales General and Administrative has increased 263% over this time period, Other Operating Expenses have increased by 8,364%! Looking at the most recent earnings report, we can see that Other Operating Expenses includes Technology and Content, and amortization. I’ve put the values from Q3 from 2009, 2013, and 2014 in the table below. Technology and Content took the lion’s share of Other Operating Expenses and is up 41% in the last year. Technology and Content is the segment that includes Prime Instant Video and Amazon Web Services (AWS), so it’s clear that Amazon is ramping up its investment in these areas. It’s increased 662% since the same quarter in 2009. The large increase in Amortization in the past year is due to increased acquisitions; most notably the recent $1 billion dollar deal for Twitch, a gaming platform, but in the past year it’s also bought Double Helix (a company that develops video games) and comiXology (a digital comics platform). The other segment of operating expenses (Sales, General and Administrative) includes Fulfillment, Marketing, and General and Administrative. Fulfillment has gone up 467% since Q3 2009 and 30% in the past year. Fulfillment includes those lovely warehouses stocked with stuff that make it so wonderfully quick to receive orders from Amazon (though shipping is included in the Cost of Goods segment). Marketing has gone up 566% since 2009 and 46% in the last year, and, general and administrative has gone up 389% since 2009 and 46% in the last year. Let’s quickly compare those operating expenses to sales, both quarterly and yearly, in these periods. The quarter over quarter spending since 2009 is more than the growth in sales, and that holds true for the yearly view a well. Any way you slice it, Amazon’s spending is increasing much more quickly than its revenue. Stepping back, this does make sense: Amazon is investing. In particular, it’s investing a lot of money on content, AWS, and fulfillment. We’ve all heard about how they’re building more warehouses in order to speed up shipping times, how they’re ramping up Instant Video to make Amazon Prime more attractive, and how they’ve increased spending in cloud-computing, as they now must out-compete Google, Microsoft, and many others. It is commendable they are not resting on their laurels, and that they are aggressively investing in new initiatives, and that they are very customer-focused which has engendered loyalty in millions of its customers. But, if it’s investing, then the natural question is when these investments will start paying off. Until they do, one would think that their $24.3 billion in sales should generate enough in the way of spending money. Well, maybe. Let’s look. Finally, we get to Amazon’s cash. 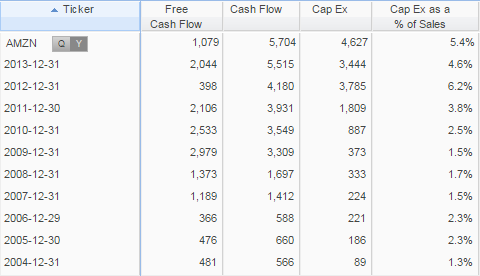 Below you can see its Free Cash Flow, Cash Flow, Capital Expenditures, and Capital Expenditures as a percent of sales. It put up an impressive free cash flow of almost $1.1 billion in the past twelve months, increasing 124% in the past ten years. However, in the years 2009 through 2011, free cash flow was above $2 billion each year. Furthermore it declined in each of those years from over $2.9 billion in 2009 to $2.1 billion in 2011. In that context, $1.1 billion in cash flow seems less impressive. And even furthermore, while cash flow grew 907% in this period, capital expenditures grew a staggering 5,099%. You can see in the last column that the capital expenditures as a percent of sales have been increasing over time as well. In particular, 2010 looks like the year that Amazon started to ramp up its capital expenditures, leading to lower free cash flow. And it wasn’t just a blip—it was essentially a change in business model, as we can see it’s stayed elevated since. Although you could argue that this is part of the investment cycle—more spending now, more profits later. This doesn’t paint a pretty picture. Since its high of nearly 12% at the start of 2010, free cash flow as a percent of sales has declined significantly, now at 1.26%—an interesting trend when you consider that Amazon’s primary talking point for investors is that it focuses on generating free cash flow. 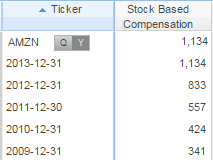 Let’s look at the details of the $1.1 billion of free cash flow Amazon generated in the last twelve months. The net number is the cash flow from operations ($5.7 billion) reduced by purchases of property and equipment, including internal-use software and website development ($4.6 billion). In the next three sections, I’m going to look at the income statement, the balance sheet, and the cash flow statement. From the income statement I want to know how well the business is operating. In the last quarter, Amazon had net sales of $20.6 billion and total operating expenses of $21.1 billion, putting its operating income at negative $544 million. They brought in $9 million in interest income, but their interest expense was $49 million. They lost another $50 million from “other expenses”, which they say is primarily related to foreign-currency losses. After settling the tax stuff, all told for this quarter alone Amazon had a net income loss of $437 million dollars which is by far their worst quarter in recent memory. So from the Income Statement, the business looks like it is deteriorating. But, as I mentioned before, they do have very strong revenue growth, in particularly in the higher margin segments of services, so over time this could turn around. 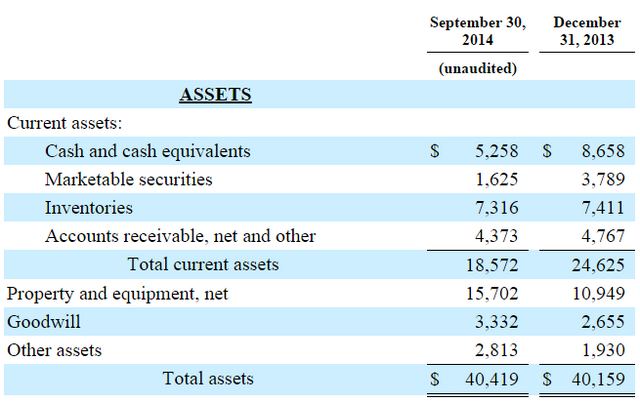 The balance sheet from the last quarter (shown below) is interesting: I couldn’t help but notice the $3.4 billion drop in cash and cash equivalents, and the $2.1 billion drop in marketable securities, so far in 2014. They’ve spent a lot of cash, which looks like it could explain the $4.7 billion increase in property and equipment. Inventories are pretty steady, which is a good sign—this means that they’ve gotten more efficient at managing inventory and their sales have grown. While the overall total assets increased from $40.1 billion to $40.4 billion, we can see that current assets went down by $6 billion. This means that the business overall is less liquid—a consequence of Amazon’s investing in its business, as well as acquiring other companies. On the plus side, this is a company with $40.4 billion in assets and only $3 billion in debt, and so by traditional measures is considered financially healthy. At the bottom of the cash flow statement there is some “supplemental cash flow information,” which includes $1.2 billion dollars spent on property and equipment acquired under capital leases in the last three months, as well as $343 million spent on property and equipment acquired under built-to-suit leases. There’s a note in the filing that these are non-cancellable operating, capital, and financing leases for equipment and office, fulfillment center, and data center facilities. Entering into lease agreements is clever, because while the rent is essentially a liability (it must be paid in the future), it doesn’t show up on the balance sheet, and it doesn’t enter into free cash flow, so the impact on the financial statements is minimal. But, these leases are financial obligations, and according to a supplemental table in the notes section on page 10 of the quarterly report, these capital leases will cost $2 billion in 2015, for a total of $4.4 billion for the total duration of the leases. By entering into these leases, Amazon has prevented its capital expenditures from increasing even more, but as a tradeoff it has increased its long-term obligations, and further reduced its liquidity. There is also a section under Note 3 on page 10 of the report about “pledged assets,” saying that Amazon has restricted $1 billion in its cash, cash equivalents, and marketable securities as collateral—this is another thing that’s not on the balance sheet, making its reported cash slightly misleading—it doesn’t have the flexibility of all that cash when $1 billion of it is off-limits. This is probably why it entered into a $2 billion credit agreement in September with Bank of America (accounting for the $2 billion bump under “Other long-term liabilities” on the balance sheet.) In sum, Amazon’s cash situation is not as good as it might seem on a cursory look. So far we’ve seen that the margins are deteriorating and Amazon is spending a lot of money, but again, the bulls say it’s in an investment cycle. So if that’s true, let’s pick a growth valuation to see, given their market cap, how much money it would have to earn for the valuation to be fair. Let’s aim for a long term P/E of 30, which is well above market average, but reasonable given their above market growth potential. With a current market cap of around $144 billion, this means they would have to generate $4.8 billion dollars in net earnings in order to justify their valuation. Let’s look at their actual earnings of the past ten years. They haven’t even come close. In their best year (2010) they had $1.2 billion in earnings, but to justify a hypothetical valuation of 30, they would need four times that. While I’m not saying it’s not possible, I am saying that given its track record, it looks to be exceedingly difficult to achieve. 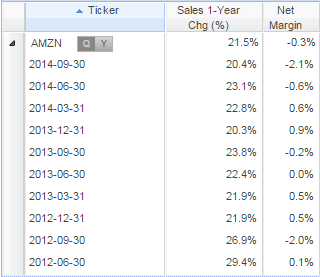 Ultimately, to me it looks like Amazon has financials like a growth company but margins like a retail company. What’s more, it’s continuing to expand in areas that are barely profitable, like AmazonFresh, and in areas that are capital-intensive, like cloud computing. The story has always been that they’re spending a lot now in order to grow as large a customer base as possible, so they can reap huge profits in the future. But right now margins are falling, operating income is falling, shares are being diluted, and they’re burning an awful lot of cash. Unless Amazon is able to turn these fundamentals around, I don’t see how they could earn enough of a profit in the foreseeable future to support the lofty valuation of the stock. I would stay away until Amazon starts showing signs that their investments are paying off with improving margins and stronger cash flow.